Since 1947 when Charlotte Bronte's Jane Eyre first appeared on bookstore shelves, fans have read and reread this beloved story of a penniless governess and her brooding mysterious master. They have listened to the demonic laughter and waited anxiously beside Miss Eyre in her master's burned bedroom while he disappeared into hidden third floor rooms without explanation. They have borne his moods, basked in his rare smiles, puzzled at his mercurial personality changes, and despite themselves, fell in love with Edward Fairfax Rochester right along with Jane. 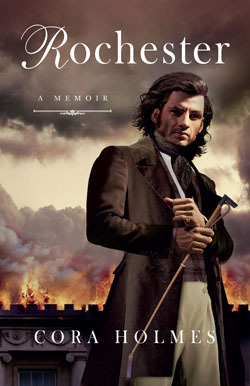 In this journal, adapted from Charlotte Bronte's novel, Jane Eyre, Rochester tells his story with unflinching honesty. From his barren childhood of privilege to his tragic first marriage he allows readers into his innermost soul, where they fall in love with him all over again. "Rochester, is a story that will be treasured by all lovers of "Jane Eyre". It is of their time together as seen through Rochester's eyes and gives the reader greater insight into his character and being. 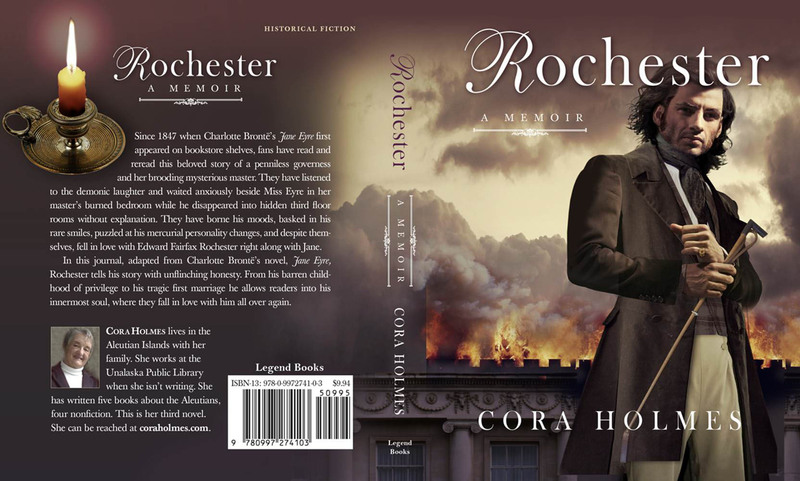 While Rochester is passionate and dangerously attractive in his arrogant and sullen manner, the writer skillfully portrays his desperate need of tenderness and love. A man who has suffered much in his life, Rochester becomes very real and endearing to the reader. Excerpt from "ROCHESTER: A MEMOIR"
I am an old man, past seventy years. The veins on the back of my left hand stand up like corded ropes. Sometimes when the candlelight is just right I can see liver spots between the scars. My right hand is gone these many years but I have grown used to its absence. I was never a tall man, but I stand straight and I'm broad and burly as a blacksmith still. My hair is silver now, as are my shaggy brows. A Vulcan, my Jane calls me still, as she searches my pockets for a comb to tame my wild locks. I am a changed man, at peace, and I have her to thank for it. The night I first set eyes on her hope had quitted me. I was bitter and weary, consumed with regrets. Fairy will-o-the wisp that she was, she never feared me, even at my fiercest, even when she should have, even when I did her grievous harm, broke her heart, and almost killed her. The letter crackles in my breeches pocket where I shoved it with no thought of folding after reading it. I wanted it only to be out of my sight. I am cold. January in England in this year of our Lord 1840 is as bleak and bitter as my thoughts. Gray battlements rise above bare thorn trees as I ride. Thornfield. Each hoof beat takes me nearer. I am tired. My mad night dash from Paris across the channel took me to my London townhouse where I changed from carriage to my best horse and thence on the road to Hay, a hundred and fifty miles of bleak snow covered hills and icy roads with nothing to occupy my mind but the ordeal ahead. The clash of iron shoes on stone strikes my heart like a hammer of doom. I shiver in spite of the great caped and furred riding cloak that envelopes me from head to foot. January twilight does not hinder my sight for there is a full moon and the ground fog only serves to soften the low fences and stile where I glimpse a small cloaked figure as I pass. If I believed my old nurse's bedtime tales I would see in that slight unsubstantial shape a fairy lurking to bewitch me, but I push the thought aside; more likely a careless workman has left his cloak on the stile. No reasonable soul would be out alone in this cursed place. Long have I dreaded my return, shunned Thornfield like a plague house; even more so now that I have doubled my degrading responsibilities with the latest burden, a child, with no blood of mine flowing through her veins. Why go back when the very thought of the place turns my black humor more bitter? I shift in the saddle. The letter's sharp edges dig into my leg. I grimace; ah, yes, the letter. If not for it, I could turn my horse and seek lighter company than what awaits me. My wife is nothing to me, or I to her. She is nothing even to herself. What is born in the blood cannot be denied. Both of us were bought and sold and those doing the buying and selling long dead and me left to pay the price. My lips twist in a scowl. And the child, Adele Varens, another galling reminder of my own stupidity. Surely one can understand if not forgive my black mood. My mother I do not remember. She died when I was but a babe. Looking back I can see she never recovered from my birth. For that my father blamed me. Of my brother Rowland, six years my senior, already my father's golden child before I left the nursery, my best memory is watching the carriage carry him away to school. The worst I try to keep hidden in the far reaches of my mind, however, one might wonder how I so easily came to the idea of locking my lunatic wife away in the dim upper regions of Thornfield Hall. At age five I discovered how impossible was escape from those rooms. But enough of these dreary thoughts. My stallion, Mesrour, ever vigilant to my slightest whim, rears on his hind legs. The icy causeway beneath his hooves gives him no purchase and he falls. His neigh of panic shatters the quiet. I wrench my feet out of the stirrups as he goes down. My leg is pinned between his flank and a rock frozen in the roadway. A sharp pain lances through my ankle. Cursing, I wrench myself free from the struggling horse. Pilot bounds up and sniffs around us, his bark rebounding off the hills, and then he is gone. With a mighty shake Mesrour gathers his legs under him. I soothe him in a whisper through gritted teeth, but his disquiet comes from a different source and he rolls his eyes at the apparition emerging from the wispy fog. A wraith, hooded and cloaked materializes, anonymous, at one with the mist, unsubstantial, dream like. My thoughts immediately return to old tales of the little folk who inhabited this stretch of Hay Lane in my old nurse's chilling bedtime stories. I shake my head to clear it. Perhaps it, too, has taken a knock. The slight form nears as I roll ungracefully onto my uninjured leg and rise. Mesour snorts and his hooves clatter on the frozen roadway. The figure stops, hooded head turning toward the agitated horse, then returns to me. I can see nothing beneath the concealing folds. A muffled voice asks if I am injured. A woman. The voice is low and musical, well bred, not that of a scullery maid or tavern wench. Not fairy but flesh and blood. I stiffen. My head clears. The bundle on the stile. She must have been sitting on the rail for a reason I cannot fathom. Perhaps she is waiting for a lover. Women, they can all be consigned to hell and the world well rid of them. I try to stand upright and take a step. Beads of sweat pop out on my brow. Damn and blast. My ankle is injured, possibly broken. Mesour moves away, out of my reach. The woman asks again if she can help me. I growl at her to remove herself from my path. With another smothered oath I attempt to walk after my horse. Pilot leaps up and puts his paws on my shoulders, his tongue momentarily blinding me in his enthusiasm. "Down," I order, the pain in my ankle voicing itself in a snarl. He drops obediently, his great black and white shape wriggling despite the impatience in my tone. I lean down and clumsily examine my leg and foot. I grimace as my fingers encounter bruised flesh through the torn leather. My breeches are soaked and muddy, as is my cloak. My riding boot, which reaches just under my knee, is ruined but has prevented a worse injury. My ankle is not broken, merely sprained. The swelling is contained inside the split leather and I hobble to the stile and sit down. The cloaked form draws near. I frown and wave her away. Still she persists, telling me she will not leave until she has seen I am fit to ride. Her voice is soft but determined, respectful but not submissive. Her accent and speech is educated, like a lady. I again command her to be gone to her own home but she does not move. Instantly I am suspicious. I do not recognize her and I own all the land within a half day's ride in every direction. A man with my secrets must always be on guard. Brusquely I demand to know where she is from. To my astonishment she points to Thornfield. The hood falls back but her face remains shadowed by a monstrous bonnet. My entire leg is aching and I am in a surly mood. This woman is a stranger and she dares declare occupancy in my house. I ask her who lives there, and she calmly gives me my name. Of course, she would know who lives in Thornfield Hall. I am the squire, however much I am absent from this cursed place. In a silken voice I ask her if she knows the squire. She denies any acquaintance. Her chin comes up and I glimpse one pale cheek of smooth unlined skin inside the bonnet. She is not a servant and she is very young. Who the devil is she? She informs me in a low voice that she is the governess. Of course, the governess; I had forgotten. So she is not a spy to ferret out my secrets. I release a pent up breath causing pain to surge anew through my wounded limb. In my desire to have done with the tiresome matter of Adele, the new ward thrust upon me six months earlier, I left the hiring of a governess to Mrs. Fairfax, my housekeeper and distant relative, her being the widow of my mother's second cousin. I feel a deep degree of relief. No one has described my features to her. The servants in my house have all been there for years. I have taken great pains in their selection. They are not talking fools. Grace Poole, of necessity, is especially closemouthed. The woman speaks again with dogged determination. She is going to Hay to post a letter and can summon help. She must be cold, I think. Her cloak is thin. She doesn't look above a child herself, a fairy creature. I see she is determined to remain until I've mounted my horse. Tiresome as a linnet buzzing around on tiny wings. I rise from the stile but not without a grunt of pain. I cannot walk unaided. I cast about for a stick I can use for a crutch and see nothing but frozen ground. She does not have an umbrella which would work for the few steps needed to catch my horse. Seeing no other remedy I ask her to bring Mesour to me. Her shoulders stiffen beneath the cloak. She drops her muff on the stile and marches resolute up to Mesour. What kind of woman is this? She tries to grab the reins dangling from his neck. Mesrour will not let her near his head. He rears and paws the air. Not fairy then, I think, but mortal, for all she looks not of this world. She hasn't bewitched my horse. Mesrour will not harm her. He is a gentle animal but he will not be caught. At last her determined efforts in the face of such futility bring a laugh bubbling up from my chest, me, who has not even smiled a genuine smile in fifteen years. I beckon her to me with my upraised hand. She approaches where I lean against the stile and I lay my hand on her slight shoulder. I encounter bones I can identify through the thinness of her cloak, dress, skin, and flesh. My fingers tingle from I know not what as if a gentle energy has transferred from her to me. I snort inwardly at my own fancy. Stupid man, I tell myself. You are tired and cold and in pain. Pay no attention to the wandering of your weary brain. It is but nonsense. Don't delude yourself. She is mortal. She is female. She is up to no good. Her collarbone and shoulder blade are like bird bones, fragile and prominent. I must lean heavily on her and I am a big man. Her strength surprises me. She stiffens her back but makes no protest. I master the saddle clumsily with the help of her cupped hands under my injured limb. I bite my under lip against the pain. With a muttered oath I settle myself in the saddle. Mesrour rears. The woman steps back from the stamping forefeet. Her bonnet slides off. At that moment the moon's glow catches her full in the face. I am transfixed. Her countenance strikes delight into my very soul. I draw in a startled breath. I am mistaken. It is me she has bewitched, not my horse. The small elfin face has cheekbones as fragile and close to the surface as her shoulder, sending her cheeks into shadowed hollows. Her eyes shine in the moonlight, changeable as water over mossy stones, green one moment, hazel the next. They are deep set and smudged underneath with faint bluish circles, fey and other worldly. Her wide mobile mouth is set in a quizzical line. I cannot take my gaze off those soft lips. She steps back another pace. I want to prolong the moment. I must touch her again. I pull off my glove and command her to fetch my whip where it lies under the hedge. She complies. I contrive to engulf her small fingers in my large square hand. They are cold. She pulls them from my grasp the moment she releases my whip. I tell her to accomplish her errand of posting a letter and return to Thornfild with utmost haste. Mesrour leaps to my touch and we are away, Pilot racing alongside. A quick look back shows my rescuer picking up her muff and sticking her hands inside. A strange unbidden thought enters my head. I want to warm those small cold hands against the bare skin on my chest. She makes her way swiftly along the path to Hay as if nothing out of the ordinary has taken place. She does not spare me a backward glance. I shake my head in disbelief. An hour since, my thoughts were of the blackest sort. Hope had quitted me. But for a chance accident I would pass the remainder of my life in that blackness. I am changed and I don't even know her name. The last mile to Thornfield is eaten up by Mesrour's hooves. We clatter through the gate and into the courtyard amid Pilot's frenzied barks. My twisted ankle, dangling at the end of my leg, is turned into a great throbbing ache. A boy darts from the shadows. "Yes, Master." He tugs his forelock and catches Mesrour's reins. In a moment the great doors of Thornfield Hall open. John, whom I have known since childhood, hurries down the steps despite his seventy years, followed by a manservant. Behind him bustles Dame Fairfax and Leah, the maid. John's wife Mary stands in the door wiping her hands on her apron. She is backlit by the light from the hall. Her silver braids circle her head like a halo. Her seamed face lights up in a smile of recognition. Always I remember her thus. Whatever kindness I received at Thornfield came from John and Mary's hands, yet even from them I withhold the ugly secret concealed within these gray walls looming before me. I give her a nod and she comes down the steps. "Why, it is the master," Dame Fairfax exclaims. She bobs her head of bushy grey curls. "Welcome, Sir. You must be hungry." In a swirl of skirts she turns her generous bulk. "Leah, quick. Master is home." John, ever quiet, reaches my horse's flank. "Master." He touches his cap. "Is aught amiss?" "A slight injury to my ankle," I groan out an explanation. "Have the goodness to help me down from this animal." "Aye, Sir. Shall I send for the surgeon?" "Yes, I shall have need of Carter." Perhaps a lucky accident, the fall, I reconsider. The sooner I see Carter, the better. With the help of John and Mary I am borne into the hall and ensconced on a settee by the drawing room fire. Mary covers me with a blanket. John brings me a snifter of brandy. I down it in a gulp and ask for more. Carter will not be gentle. After another soothing draught of brandy I hold my chilled hands to the fire and remember her small icy ones. Has she reached Hay and posted her damn letter? Has she returned? The touch of her small cold fingers comes back to me. My gaze involuntarily lifts to the arch and doorway beyond. A small girl in a whirlwind of rustling pink taffeta bursts through the arch. "Monsieur, Monsieur Rochester, you ave return." She stops before me and drops into a deep curtsey. Glossy brown ringlets spill over her shoulders. She smiles, her tiny cupid's mouth a mirror image of her mother's. I stifle a shudder. As always when I see her, I search for some resemblance to me in features and mannerisms. I find none. She is not a child of my blood, only of my stupidity. Still she is but a child and even I could not abandon her to the streets of Paris. She sinks to the white carpet beside the settee. "What ave you brought me?" "What?" Adele," I tease her, "The same greedy girl I brought from Paris six months ago? "Clamoring for a cadeau already? Has your new governess not taught you manners?" "Miss Eyre teaches me mathematics and English?" Adele's bright blue eyes hover longingly over my coat pocket. "Sil-vous-plait, Monsieur, you promised when you went away." "So I did." I make myself brush my hand across her curls. My father could not bear to touch me. Not once in my childhood do I remember being touched in kindness except by servants. I will not do that, even to the child of Celine Varens. "You shall have your cadeau when my carriage arrives." She rewards me with a kiss on the cheek, whether for the touch or the news of a gift, I do not know, the latter I suspect. "Now, tell me, how do you like Miss Eyre?" "My governante." Adele's face lights up. "I like her very much, but..." she shakes her head dolefully. "She is not pretty." With a pat she smoothes her pink ruffles. "She wears ugly dresses." A commotion ensues beyond the arch. Mrs. Fairfax bustles in, her bonnet askew above her pink face. "Sir, the surgeon is come." Behind her, a tall raw boned man looms. As he leans to grasp my hand I see through the arch into the hallway a flitting black shadow swiftly cross the tile and ascend the stairs. My heart races. She is come home. I am able to put worry for her aside. I return the Dr's. hand shake so heartily he looks at me in surprise. "Carter, Accept my apologies for the lateness of the hour." I indicate my leg. "But it might need a splint." "Good God, Man." Carter drops his medical bag. "You have need of a surgeon this night." "Come, Adele." Mrs. Fairfax swoops down on the child. "Your nurse, Sophie, is looking for you." I expect a tantrum, at the very least tears and pouts and pleading to stay longer. Adele arises and curtsies. "Good Night, Mr. Rochester." She nods her head gravely toward Carter. "Goodnight, Monsieur." Ah, Miss Eyre, I savor the knowledge of her name in my mind. Forgive my thoughtless comment to Adele about her lack of manners, you very well might be a fairy to have wrought such a miracle. Carter divests himself of his coat and sets to work removing my boot. "Damned shame," I grumble as he cuts away the ruined leather. "Waste of a fine pair of boots." "Lucky for you." Carter probes my swollen bruised flesh. I wince. "Without them, you most likely would have broken some bones. As it is, all you have is a sprain that will be set right in a few days with a splint." I nod. Carter sets to work. The pain is dulled by brandy. Whatever else is to transpire will need more than spirits. "I came as soon as I got your letter." Carter does not look up. "That was my hope." Thus all our conversations go. Terse and bald, the subject unthinkable. Carter knows my secret. My wife is one of his best patients. Why does he not expose me? I pay him well. Grace Poole knows my secret, too. I pay her more. God knows, she earns it. They both do. However, I believe Carter would discharge his duties toward my wife and keep silent if I didn't pay him a shilling. He attended my father on his deathbed. He knows what my father did, and Rowland, also. Carter despised them as much as I did, for Carter is the friend of my childhood, as much as I was allowed to have friends. He is the son of one of my father's grooms. He ran away and joined the army when he was fourteen to become a stretcher bearer. On the battlefields of France he became a field surgeon. Afterwards he apprenticed himself to a physician in London. When he returned, fully qualified, I was in the West Indies. Father and Rowland never recognized him as the Thornfield stable urchin else they would never have allowed him to attend them. It was Carter who wrote me of their deaths. Neither John nor Mary can write. "Has there been a change?" I ask. Then I hear it, the sound that keeps me roaming over half the world in an attempt to forget. A long gutteral laugh that turns into a banshee wail at the end and freezes the blood in my veins. Carter looks up from his task. "Not in her." "Grace Poole is taken to drink." "Damnation." I lapse into silence. This is drear news. For the job Grace Poole performs, caretaker to my wife, she needs a clear head. In her madness my wife is cunning. Twice on the voyage from Jamaica she escaped me, once to obtain a knife, of which I still bear the scar on my arm, and once to fling herself at my person in so savage an attack I was sore pressed to save my own life without taking hers. She bears me an immense hatred as she does anyone who crosses her will. Grace Poole falls into that category. "I have found her dead drunk," Carter continues, as his nimble fingers wrap a bandage tightly around my ankle and tie the ends in place. Who can blame her? An image of her snarling charge surfaces in my mind. "The keys?" "Always secure." He stood up and observed his handiwork. "Let me help you to bed, Edward, you look uncommon weary." "In a moment, Carter." I nod toward the brandy decanter. "Will you have a drink with me? I feel the need of its numbing properties." "A pleasure, my friend." Carter pours us a generous portion. "Don't try and see her tonight." His brow creases in a frown. "You're in no shape for a tussle." "No, not tonight," I agree, coward that I am. I swallow my brandy. "Go home. Send John to me on your way out. Thank you." "You're welcome. I'm glad you are come home. I've missed you." Carter shrugs into his coat and picks up his bag. He reaches down to grasp my shoulder. "Good night, then." I open my eyes. John stands before me. His are the hands that touched me in kindness when I was a child. His rheumy eyes drift over the near empty brandy decanter and then to my bandaged ankle resting on the settee. "Shall I send for one of the lads to help you to bed?" "Not just yet." I shake my head. "I must speak to Grace Poole. Send word to the third floor."